Elvis Presley’s engraved, inlaid and carved Smith & Wesson Model 19-2 double-action revolver sold for $195,500 (world auction record for the model). ROCK ISLAND, ILL. — Two of Elvis Presley’s lavish revolvers were offered in Rock Island Auction Company’s May 5–7 firearms auction. The revolvers were accompanied by several items personally owned by the performer, such as a diamond and ruby studded Shelby County sheriff’s badge, the Elvis-signed contract to purchase Graceland and numerous personal files also signed by Presley. Engraved, inlaid and carved Colt Python double-action revolver presented by Elvis Presley to employee Richard Grob was bid to $172,500 (world auction record for the model). Bidders showed up in large numbers for this sale, and the auction house had to make accommodations. In preparation for the unprecedented crowds, new phone banks were added for record numbers of live telephone bidders, more help was hired and more bids were processed than ever before. It all added up to a realized total of $16.1 million – one of the largest auctions in the firm’s history and the largest firearms auction to date in 2017. The auction started with a bang as sought-after Winchesters were scooped up by collectors as quickly as they could be offered. One such Winchester, a special order, deluxe Model 1873, like many others that morning, continued to show why the antique Winchester market is stronger than ever by achieving $46,000, besting its $35,000 low estimate. Later that day the finest known Elgin Cutlass pistol found a fitting price and a new home for $48,875. However, more excitement was yet to come. Even 40 years after his untimely passing, the “King of Rock & Roll” can still fill a room. The auction hall became crowded about 50 lots prior to the offering of the Elvis Presley items in the sale. Soon it was packed and standing room was being taken where it could be found. Everyone was waiting for the King to arrive, and each lot seemed to drag its feet. People were anxious and stirred in their seats, ready to see what the performer’s items would bring. After what seemed like hours, they finally had their turn at the block. The air was electric with anticipation and then the fun began. The Smith & Wesson 19-2 revolver, shown being held by Elvis in a period photograph, was the first to go and was won after a lengthy bidding battle by a live phone bidder for $195,500. 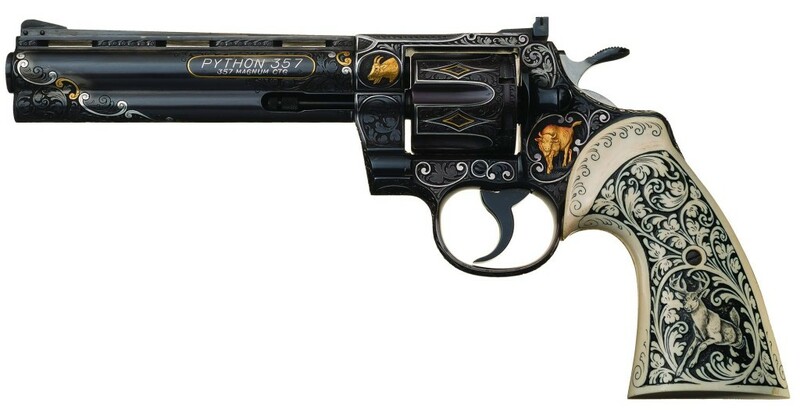 Next up was the equally lavish, Presley-owned Colt Python. It, too, saw a healthy payday and brought $172,500. Both revolvers now hold the new world record prices for their respective models. 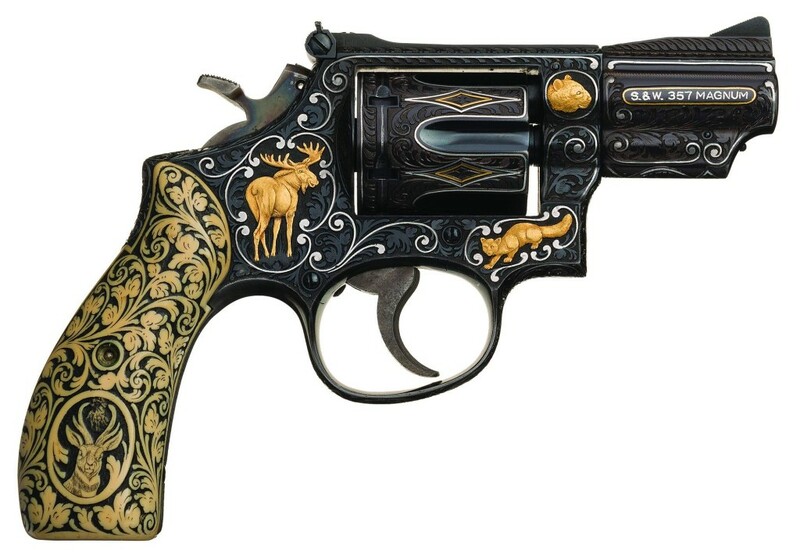 The “King” himself purchased the revolvers in 1970 from a Beverly Hills sporting goods store before sending them to Germany to be elaborately decorated. One was presented to Vice President Spiro Agnew as a gift but was returned a short time later while Agnew was being investigated for corruption. Afterwards, Elvis’ gem-studded sheriffs badge rode off into the sunset for $40,250, and the original sales contract for Graceland signed off for $43,125. Prices reported include the buyer’s premium. Watch for a complete report on this sale in an upcoming issue.